Chemical addiction occurs when young, immature brains are exposed to addicting substances that cause permanent physical changes in brain structure and function. Once addicted, the individual can never be cured or become "unaddicted." Early first use is the key to understanding young people and addiction: the younger an individual is at time of first use, the more likely it is that addiction will develop. Most parents wait far too long before they consider ways to prevent addiction-or detect secret use of alcohol and drugs. This book advocates an early and proactive stance. To effectively prevent addiction, parents must observe and monitor their children and the activities in which they're involved, and Dr. Fleming outlines strategies that hold both parents and children accountable. Moral character and a spiritual life are of critical importance when making life choices, and this book helps parents guide their children through the difficult adolescent years. Treatment of Addiction: Cause for Hope or Fruitless Effort? How to Detect, Deter, and Monitor for Addicting Drugs—and Why you Should! 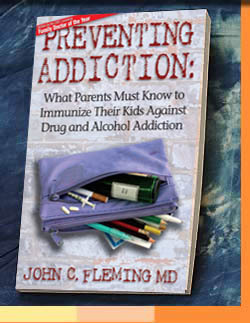 In this unique handbook, Dr. Fleming Provides the latest medical and scientific information to help parents understand what they can and must do to prevent addiction in their children. ⇒ Buy the Book today!